Chocolate Blackout Cupcakes feature a dark chocolate cupcake filled with chocolate ganache and topped with a rich dark chocolate buttercream. For serious chocolate lovers only!! Get my FREE Buttercream Guide here! Taste: So much chocolate flavor it’s CRAZY!! 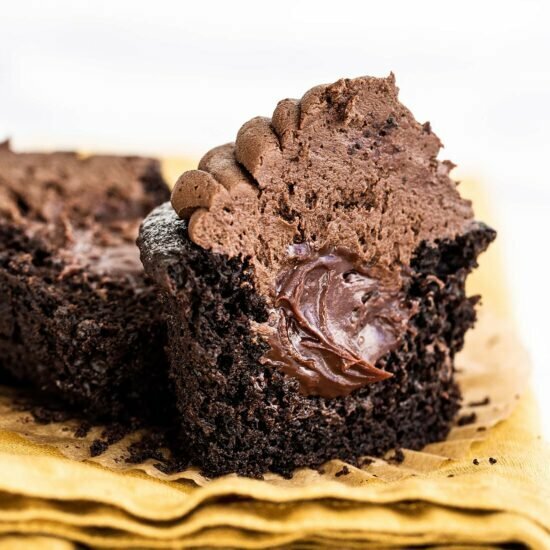 Texture: The cupcake is moist and rich, the ganache filling is slightly fudgy, while the buttercream on top is thick and creamy. Heaven in every bite! Ease: Fairly easy, but pretty messy. Pros: Perfect cupcake for any chocolate lover. Cons: None! But if you don’t love chocolate, these will probably be a bit much for you. Back in my earlier days of blogging I felt the need to follow a bunch of “rules” that don’t really actually exist. I thought I had to post a perfect balance of sweet and savory recipes, and that I shouldn’t use too many of the same ingredients in recipes posted back to back. Now I realize the best thing I can do is to simply share with you what truly excites me the most. That usually comes in the form of homemade baking recipes and CHOCOLATE. Lots and lots of chocolate. Always and forever. 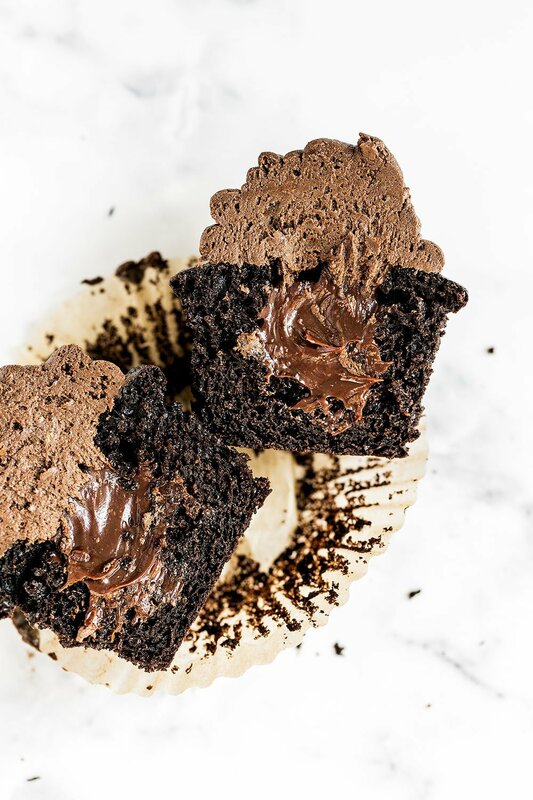 The chocolate in these Chocolate Blackout Cupcakes hits you immediately. Especially if you take a big enough bite to reach the chocolate ganache filling right off the bat. There’s so much goodness in both taste and texture happening here that I encourage you to fully savor every moment. Also since we’re getting closer to Halloween, I think these cupcakes would be the perfect treat to bring to any Halloween party! You could even make white chocolate spiderwebs to decorate these with. For a really dark color and rich chocolate flavor, I like to use a dark cocoa powder product like Hershey’s Special Dark. It’s actually a combination of both natural and Dutch cocoa so you kind of get the best of both worlds! This recipe calls for vegetable oil instead of melted butter. 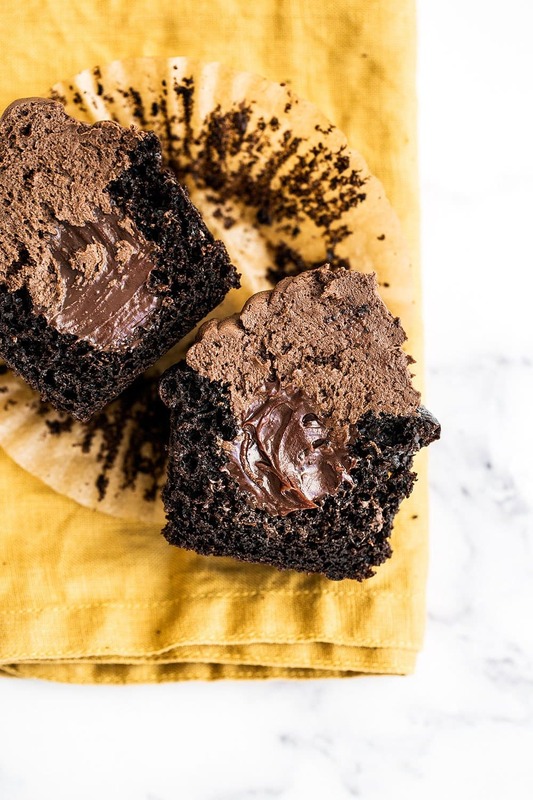 Oil creates an ultra moist texture and open, slightly spongy crumb which is perfect for chocolate cupcakes. Since oil is liquid at room temperature, it gives the palate a sensation of moisture even though it contains no water! Give your vegetable oil a sniff before using to make sure it’s fresh. Feel free to use melted coconut oil instead of vegetable oil. The more whole eggs a cake recipe has, the richer it’ll be. For this recipe I added in an extra egg yolk. This adds a touch more more richness, chewiness, and structure so the cupcake can stand up to a generous frosting. This may seem like a strange ingredient, but I promise you won’t taste it in the final result. It simply helps to activate the baking soda to create tall fluffy cupcakes. These are my favorite cupcake liners that basically never stick. They’re usually sold at Target as well. If sticky liners are a common problem for you, check out this helpful blog post. This buttercream has a LOT of chocolate in it, both in the form of melted chocolate and cocoa powder. It’s really thick and rich. You can play around adding in more cream to thin it out, or more powdered sugar to thicken it up. I also have more tips in my FREE Buttercream Guide here!. 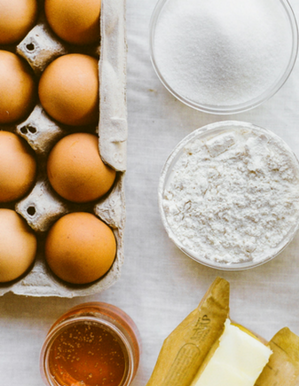 Interested in learning more about the science of baking? Check out my online baking class, The Magic of Baking! All of the video lessons, downloads, and side-by-side comparison photos are ready and waiting for you right now. 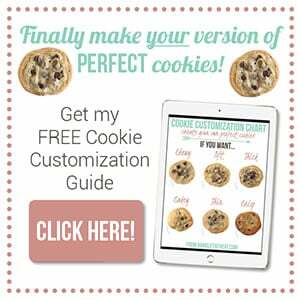 It’ll show you how and why baking recipes work so you can bake with complete confidence. Learn more here. Place the chocolate and cream in a medium microwave-safe bowl and microwave until mixture is warmed, about 30 seconds. Whisk until smooth. Place mixture in refrigerator until just chilled and firmed, no longer than 30 minutes. In a medium heatproof bowl add the chocolate and cocoa. Pour hot water over mixture. Cover and let stand for 5 minutes. Whisk mixture gently until smooth then set aside to cool. Line a standard 12-cup muffin tin with foil or paper liners. Using a spring-loaded scoop, divide the batter evenly among prepared muffin cups. Bake until cupcakes are set and firm to the touch, about 17 to 20 minutes. Let cupcakes cool in pan on a wire rack for 10 minutes before removing from pan to cool completely, about 1 hour. Cupcakes can be stored in an airtight container at room temperature for up to 1 day. Using an apple corer or pairing knife, slice a small section of the center of the cupcake, being careful not to slice through the bottom. Fill each hole with 1 heaping teaspoon of the firmed ganache. In the bowl of a stand mixer fitted with the paddle attachment, mix together the sugar, cocoa powder, and butter. Mix on low speed until well blended and then increase the speed to medium and beat for another 3 minutes. Add the salt, vanilla, cream, and cooled melted chocolate and beat on medium for 2 minutes, or until light and fluffy. Spread or pipe evenly over filled cupcakes. Serve or store covered at room temperature for up to 1 day, or covered in the fridge for up to 3 days. These sound amazing! I have the official cupcake corer gadget but I am wondering if the ganache would work as a layer in a layer cake? Thanks! It should, but I would double it at least! Would you need to make any adjustments to bake this recipe into a cake? 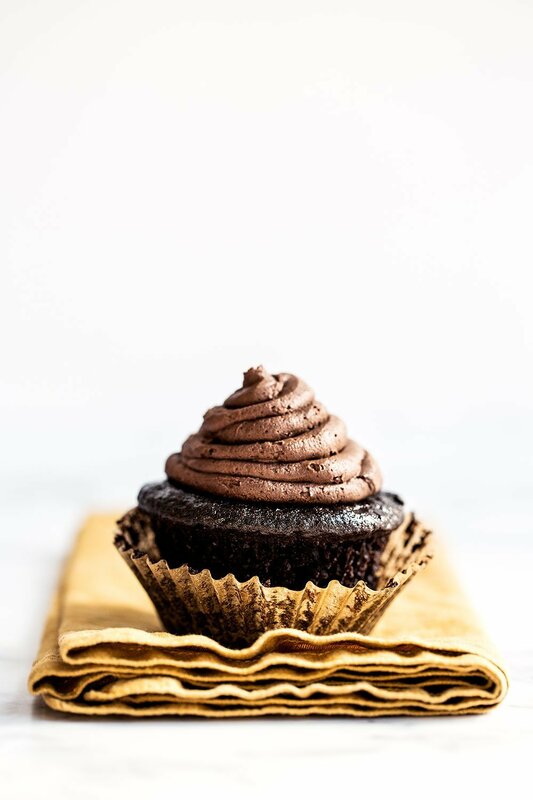 You could use the dark cocoa with that recipe, and double the ganache & frosting from this cupcake recipe to use. These sound and look phenomenal! My question is do dark cocoa and unsweetened cocoa have the same chemical makeup (i.e. can they be used interchangeably in a recipe?)? Thank you! Made these a couple of days ago. OMG!!!!!!! they are absolutely fabulous!!!!! Will be making them again, hopefully will share them!! I think that I have texted you before. Just a quick note… I am probably old enough to be your Grandmother! Have been baking since I was 25…Over 50 years ago! and I am still employed as a full time Pastry Chef. Have owned my own award winning shop but after a long but sudden onset serious illness was unable to work for over a year. So was unable to keep my building during my recovery. My spouse was not a fan of giving me money or emotional support. God must have had a plan! 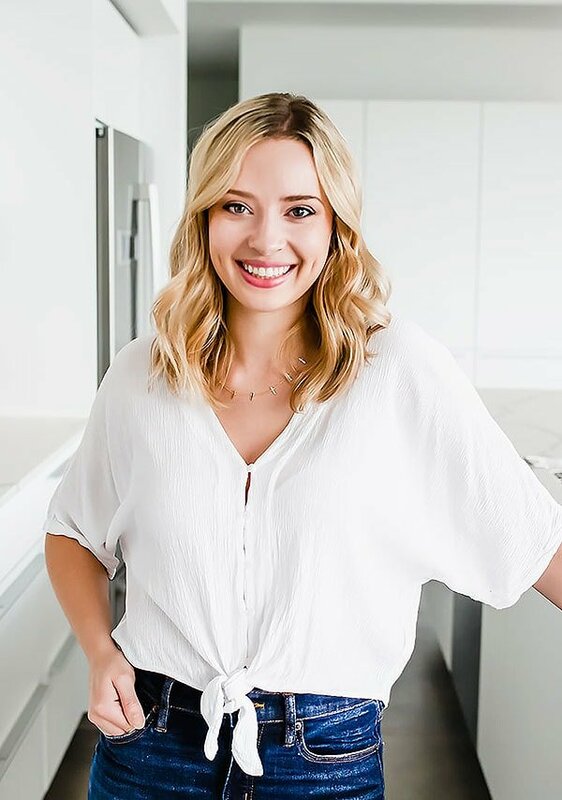 Anyway, I am not in the habit of sending comments to these sites but am such a FAN of yours that I feel almost compelled to let you know how much enjoy not only your recipes but your personality that shines through! 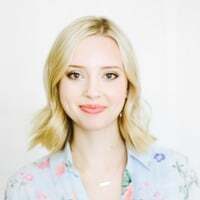 I was far from as pretty as you but was blessed with a Mentor that gave so generously of herself to share her skills and all of the tips and hints that are worth their weight in gold! We met in such a way that I can only say had to be arranged God or an angel. She was my best friend for over 20 years until she died. I have had a long career in healthcare as well as baking. Graduated from the French Pastry school (at 55!) and still teach and bake..as I mentioned. Raised 5 children and out lived 2 spouses. . my current is a real challenge and my only hope is that I will out live him! He is 85, has the first buck he ever made I’m sure and doubt if he has given my $20 since I married him. Hope God hurries up with a plan for this one. Anyway, Love your personality and recipes. I wanted to wish you Happy Holidays and let you know that you have a Fan. I am sure you are BUSY but at some point I would really love to get to know more about you. I have been a food editor (Pulitzer Prize winning paper) for 8+ years, After 1 year, my bakery was listed in USA Today’s Top Ten Bakeries in America, God only knows how that happened! and have many other awards from Natl Honey Board to others from competitions and publications to mention. Have made GF and later Vegan for over 50 years! My only son was allergic to wheat, dairy, coloring, eggs and other foods to the point where I was fearful that he might not survive. There were NO Whole Foods, Trader Joes or computer sites that sold GF ingredients so I bought a wheat grinder and made my own Rice flour and read all I could find in medical books about food allergies ..and did the best I could. . . .he is now in his early 50’s and doing very well, against all odds. I do have some VERY nice recipes that I would be willing to share if you might like. None of my girls bake although one has an award winning catering company nearby. I won’t go on but needed to let you know just how much I do enjoy your web site and recipes. I think that I will make a batch of those Blackout cupcakes this afternoon! Am so happy to see that you teach as well. Many of my students have become lifelong friends. Have a class Sunday afternoon. Will teach Buche de Noel, hands on class for 12. God Bless and Happy Holidays to you and yours. I need to make two dozen cupcakes. Can I double the recipe or do I need to make two batches?